UUCE is excited to offer SpiritJam, a new style of religious education for people of all ages. We started in the Fall of 2016, and are thrilled with the flexibility and fun of this program! Each jam session is designed to uniquely reflect that month’s all-church theme. Volunteers can plug in wherever and however they are able – our dedicated teaching faculty will make sure that the program is fun, safe, exciting, and engaging for everyone! If you have a knack for knitting, a penchant for politics, a flair for flamenco, or just want to get messy with crafts, you are invited share your passions and interests with our youngest UUs. 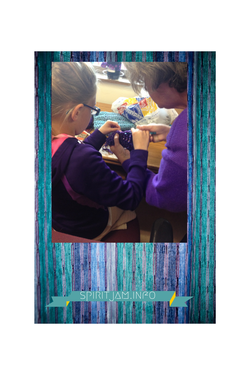 SpiritJam is firmly rooted in Unitarian Universalist principles, values, and history while offering a more interactive and intergenerational approach to learning! SpiritJam was created by DRE Katie Covey of Boulder Valley, CO. A DRE for over 30 years, Katie has written numerous RE Curriculum for the Unitarian Universalist Association – Chalice Children, Circle of Trees, and Toolbox of Faith, to name a few. Arising out of her experience, wisdom, and passion for dynamic religious education, this new model has changed the way her church “does church” by integrating the generations and allowing people to participate as they are able without over-burdening volunteers. We are very excited to implement her concepts here in our community!